It used to be that you needed to spend thousands of dollars for a top performing TV. You still can, but these 55-inch TVs prove that there's no need to. TCP might not be a household name, but based on the performance and value of the TCL 55P607, it may soon be. We also found a videophile-quality LG OLED set at a very mainstream price. Reviewers are impressed by the TCL 55P607. This is a 4K set with black level performance that stands up well when compared to TVs that cost considerably more. Color performance is outstanding as well, and both HDR and wide color gamut are supported. For cord-cutters and others interested in streaming content, the full Roku platform is built-in, and no streaming system is as comprehensive or as easy to use. The price is the show-stopper however, with experts saying that it outperforms and out-features sets costing twice to three times as much. If the best possible picture matters more than anything else, the 55-inch LG OLED55C7P OLED TV belongs at the top of your list. Though relatively expensive, the value is terrific for a 4K OLED TV. The picture quality is as good as pricier versions -- so good that some reviewers put it among the best TVs ever made. OLED requires more careful use than LED sets, so this set is a better choice for enthusiasts rather than casual viewers, but it simply blows away every other current TV in just about every picture-quality measure that matters. If you're in the market for a new TV you're in for a treat as prices for HDTVs have dropped dramatically and performance has improved just as much. Prices for sets with cutting edge technology -- including 4k (also called Ultra High Definition, or UHD) and OLED (organic LED) -- have started to tumble as well. Smart sets -- including bargain-priced TVs with Roku and other robust streaming platforms built in -- are also available with lower-than-ever price tags. But, and here's the rub, finding the perfect TV for you and your family can be a bit of a juggling act. For most buyers, an LCD TV will be the first, and in many cases only, choice. These TVs come in sizes smaller than 10 inches all the way up to 90 inches and beyond. Prices cover a similar expanse, with 32-inch sets available for well under $150 (and smaller-screen TVs available for still less) to nearly $20,000 for big-screen, flagship TVs. In between sit a host of TVs with varying performance and features. The good news is that you can find a nice assortment of good sets at prices that are substantially less than in past years -- including a terrific 55-inch TV that delivers top performance and features at a fraction of the price of some competitors. OLED is the only other current TV technology, and if you prize picture quality over everything else, you'll certainly want to consider an OLED TV. Cost used to be a major barrier, with sets running into the thousands for more advanced models with bigger screen sizes. You can still go there if you want, but we also found a 55-inch stunner -- so good that some are putting it among the best TVs ever made -- that will set you back less than $2,000. In all the years that we've been surveying the TV market for our readers, making a call for the best TV for most people has never been easier. TCL hasn't been a household name, at least not until recently, though they'd been in the TV game for many years producing house-brand sets for retailers and under license using brand names like RCA. Now, under their own brand, the company is enjoying explosive growth, earning a spot among the top five brands, in terms of sales, in the U.S. Looking at the TCL P-series TVs, including the 55-inch TCL 55P607 (Est. $650), and the Best Buy exclusive TCL 55P605 (Est. $600), it's easy to see why. Most experts that have tested these TVs either like them very much, or flat out rave about them. They are an Editor's Choice at PCMag.com, named the Best TV for Most People by Wirecutter.com, Best Value TV by TechRadar.com and the best 55-inch non-OLED TV by CNET. Users are raving, too; the TCL 55P607 earns a 4.3 score at Amazon.com based on over 260 reviews, while the TCL 55P605 earns a 4.7 star rating at BestBuy.com based on nearly 250 reviews. That said, reviewers that don't grade on a curve, such as ConsumerReports.org, are a little less impressed as the picture quality is merely very good rather than top shelf. If you value picture quality over everything else, and have the budget to back that up, we have a recommendation for an OLED TV with fabulous picture quality, but that won't completely drain your wallet, a little further down this page. Okay, now that the picture purists have moved on, let's explore why this is the best 55-inch TV for most people. Yes, it is outdone in picture quality by some TVs, but it's not all bad news on that front, and testing by some experts hold that the image is actually better than on some sets with much bigger price tags. "Overall, the TCL offers almost all the performance you'd expect from TVs that cost two to three times as much, says Chris Heinonen at Wirecutter.com. "Even then, you're unlikely to ever notice a difference unless you're comparing them side-by-side with specific content, as we did." The set features a full-array, local dimming backlight for terrific, but not bobble-free black performance. Various reviewers note that black uniformity isn't perfect (which means some areas of the screen will look brighter than others) and that blooming (a common artifact in which bright areas can bleed into dark ones) is a little more prevalent than in some competing sets, while also allowing that neither is particularly bothersome when viewing typical program material. More disturbing to some is that, like many LED TVs, picture quality can drop off quickly if you are not sitting more or less directly in front of the set. On the plus side, black levels are deep, allowing for "improved contrast and pop in all lighting situations," CNET's David Katzmaier says. The TV set offers 4K resolution, HDR support (including Dolby Vision) and Wide Color Gamut. "Wide Color Gamut (or WCG) is the driving force behind the TV looking more saturated – blues being bluer, greens being greener and so on," says Nick Pino at TechRadar.com. Gamers take note: The set includes a game mode that reviewers say sacrifices a little picture quality but offers less input lag than any other 4K set tested to date. Saving what could be the best (at least for many people) for last, the set has the Roku streaming platform built in. "My favorite Smart TV system is Roku TV, with its thousands of apps and dead-simple interface," says Katzmaier, and most other experts heartily agree. Roku still has more content streams than any other platform, including more 4K and HDR content, making it a perfect match for the TV. The TCL 55P607 comes packaged with an advanced remote control that gets some nice feedback. It features voice search for navigating through all of the available Roku content, a headphone jack for private listening via the remote itself, a remote finder, and RF connectivity so that you don't need to have an unobstructed line of sight to the TV to use the remote. However, the remote included with the TCL 55P605 isn't quite as nice. It's a standard IR clicker, and lacks all of those added features. If you don't care about them, the TCL 55P605 is otherwise identical, and priced around $50 cheaper. Availability is a bit of a concern. At the time of this report stocks were tight, and thanks to its popularity and value, some retailers were selling the TCL 55P607 above its $650 MSRP. 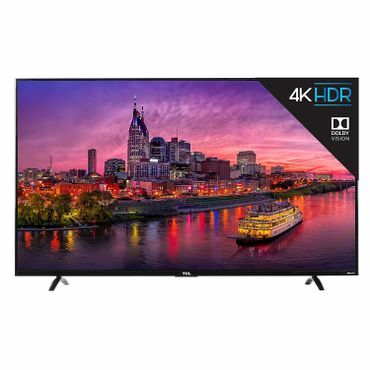 If you run into problems locating the TV at a fair price, you can find authorized resellers at the TCL website, and the Best Buy exclusive TCL 55P605 appears to be in ample supply. But perhaps the biggest negative is that if you want a P-series TCL set, the company is only offering it in a 55-inch size. That will certainly be an issue for some, but on the other hand, 55 inches sits squarely in the sweet spot for many buyers, and many viewing situations. If being limited to a 55-inch TV is an issue, the Vizio M-series that we named as a Best Reviewed pick last year remains a consideration. The 2017 version has not been as widely reviewed as of yet as the TCL P-series, but initial feedback is positive. That said, while PCMag.com grants it an Editors' Choice award, it does allow that the TCL P-series TV offers both better contrast and color range. Vizio's SmartCast smart platform is improved from last year, and now offers some dedicated streaming apps. However, users who want something other than the top tier streaming providers (and even some of those are missing, such as YouTube) will be leaning heavily on its built-in Chromecast support for content. 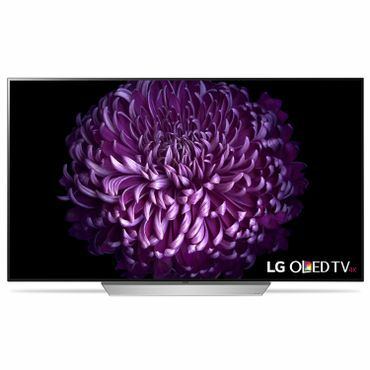 For those who demand the very best picture quality, regardless of price, OLED remains the best choice, and the 55-inch LG OLED55C7P (Est. $1,800) is our Best Reviewed pick among OLED sets. Even better, price drops and promotions have brought pricing down considerably since the set first debuted. Sure, you can spend more for spiffier styling and better sound quality, or a lot more for a bigger screen, but when you can get every ounce of picture goodness that OLED technology offers for under $2,000 there's no reason to. If you demand a larger image, a 65 inch set in this series is also available, but the 65-inch LG OLED65C7P (Est. $2,800) sells for around $1,000 more. How good is this TV? "The LG C7 is the best-performing TV we've tested to date," CNET's Katzmaier says. CNET hasn't made its final call as of the time of this report, but said that it's a "Favorite for best high-end TV of the year." Other reviewers have no reservations at all. It's an Editor's Choice pick at PCMag.com and Reviewed.com, with the latter granting it a perfect 10 score. It's also Recommended by ConsumerReports.com, named the best TV in both of its available sizes at Rtings.com and is the upgrade pick at Wirecutter.com (though the latter is based on a more casual review than what was done for the TCL set above.). That just begins the list of accolades. Bluntly put, every reviewer that's tested this TV gives it major props. Users love it, too, granting it a 4.4 star score at Amazon.com based on more than 150 reviews. This 4K HDR-compatible OLED TV hits most of the picture-quality benchmarks. Some small nits are picked by various experts, but nothing that will show up in viewing outside of a test bench. PCMag.com grouses a very little bit about a too warm magenta -- something that Will Greenwald says can be cleared up by a professional calibration. CNET says that uniformity while very good, isn't quite perfect -- though any imperfections are still far less noticeable than what would be seen with even the best LED set ever made. But forget the test bench -- "Besides impressive test results, the C7P simply produces a fantastic picture," Greenwald adds. Brightness is a little bit of a laggard compared to the brightest LED TVs, but the set remains compelling even in well-lit rooms and nearly unbeatable when watching movies or other content in dark spaces. One plus for big families: Unlike LED sets, there is no drop off of picture quality when viewed off axis. LG's WebOS smart platform isn't especially robust, though CNET says the "menu system feels more mature and snappier than ever on the 2017 models." Still, while you can find more content with other TV makers (or via Roku), the key content providers are there -- and the quality of the streaming platform shouldn't be a make or break issue for anyone considering this TV. When it comes to TVs, there is no shortage of expert review sources. Sites such as ConsumerReports.org, CNET, PCMag.com, Wirecutter.com, Reviewed.com, Rtings.com, TechRadar.com and many, many more subject the sets they review to hours of bench and real-world testing to find which ones provide the best performance and the best value. Users fill in the rest of the picture, and to find out which ones deliver the most satisfaction once at home, we turned to the thousands of user reviews you can find on sites such as Amazon.com, BestBuy.com and elsewhere. Great or at least very good performance.